Umbilical hernia repair is surgery to repair an umbilical hernia. An umbilical hernia is a sac (pouch) formed from the inner lining of your belly (abdominal cavity) that pushes through a hole in the abdominal wall at the belly button. You will probably receive general anesthesia (asleep and pain-free) for this surgery. If your hernia is small, you may receive spinal, epidural block, or local anesthesia and medicine to relax you. You will be awake but pain-free. Your surgeon will make a surgical cut under your belly button. Your surgeon will find your hernia and separate it from the tissues around it. Then your surgeon will gently push the contents of the intestine back into the abdomen. 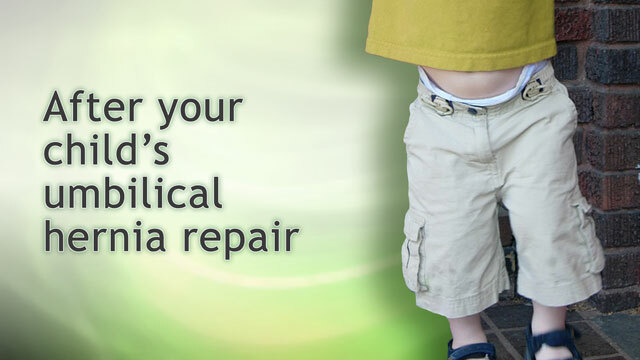 Strong stitches will be used to repair the hole or weak spot caused by the umbilical hernia. Your surgeon may also lay a piece of mesh over the weak area (usually not in children) to make it stronger. Umbilical hernia can also be repaired using a laparoscope. This is a thin, lighted tube that lets the doctor see inside your belly. The scope will be inserted through one of several small cuts. The instruments will be inserted through the other cuts. If your child is having this surgery, the surgeon will discuss the type of anesthesia your child will receive. The surgeon will also describe how the surgery will be done. 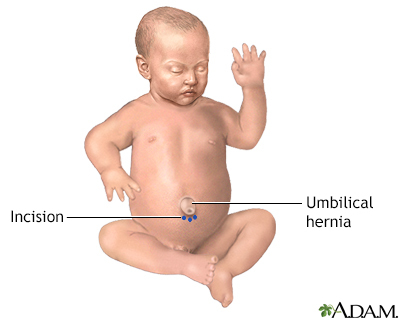 Umbilical hernias are fairly common in children. A hernia at birth pushes the belly button out. 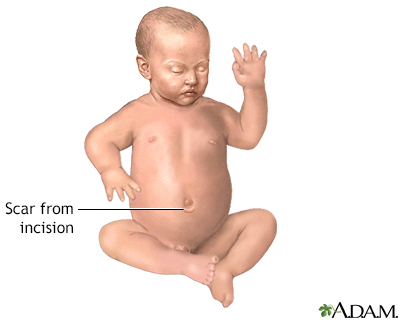 It shows more when a baby cries because the pressure from crying makes the hernia bulge out more. In infants, the problem is not usually treated with surgery. Most of the time, the umbilical hernia shrinks and closes on its own by the time a child is 3 or 4 years old. The hernia is painful and stuck in the bulging position. Blood supply to the intestine is affected. The hernia has not closed by age 3 or 4. The defect is very large or unacceptable to parents because of how it makes their child look. Even in these cases, the doctor will probably suggest waiting until your child is 3 or 4 to see if the hernia closes on its own. Umbilical hernias are also fairly common in adults. They are seen more in overweight people and in women, especially after pregnancy. They tend to get bigger over time. Smaller hernias with no symptoms sometimes can be watched. Surgery may pose greater risks for patients with serious medical problems. Without surgery, there is a risk that some fat or part of the intestine will get stuck (incarcerated) in the hernia and become impossible to push back in. This is usually painful. If the blood supply to this area is cut off (strangulation), urgent surgery is needed. You may experience nausea or vomiting, and the bulging area may turn blue or a darker color. To avoid this problem, surgeons often recommend repairing the umbilical hernia in adults. Surgery is also used for hernias that are getting larger or are painful. Surgery secures the weakened abdominal wall tissue (fascia) and closes any holes. Get medical care right away if you have a painful hernia, or a hernia that does not get smaller when you are lying down or that you cannot push back in. The risks of surgery for umbilical hernia are usually very low, unless the person also has other serious medical problems. Your surgeon or anesthesia doctor (anesthesiologist) will see you and give you instructions for you or your child. The anesthesiologist will discuss your (or your child's) medical history to determine the right amount and type of anesthesia to use. You or your child may be asked to stop eating and drinking 6 hours before surgery. Make sure you tell your health care provider about any medicines, allergies, or history of bleeding problems. Most umbilical hernia repairs are done on an outpatient basis. This means you will likely go home on the same day. Some repairs may require a short hospital stay if the hernia is very large. After surgery, your provider will monitor your vital signs (pulse, blood pressure, and breathing). You will stay in the recovery area until you are stable. Your provider will prescribe pain medicine if you need it. Follow instructions on how to care for your or your child's incision at home. Your provider will tell you when you or your child resume your normal activities. For adults, this will be in 2 to 4 weeks. Children can likely return to most activities right away. There is always a chance that the hernia can come back. For healthy people, the risk of it coming back is very low. Blair LJ, Kercher KW. Umbilical hernia repair. In: Rosen MJ, ed. Atlas of Abdominal Wall Reconstruction. 2nd ed. Philadelphia, PA: Elsevier; 2017:chap 20. Carlo WA, Ambalavanan N. The umbilicus. In: Kliegman RM, Stanton BF, St. Geme JF, Schor NF, eds. Nelson Textbook of Pediatrics. 20th ed. Philadelphia, PA: Elsevier Saunders; 2016:chap 105.